The other day I was trying to think of a way to argue that CC Sabathia is better than Felix Hernandez that didn’t involve pointing out that Sabathia has won more games, because it would be clever and thus virtuous. Sabathia has pitched less, struck out fewer batters, walked more, given up more hits and home runs, pitched seven or more innings less frequently and pitched eight or more much less frequently. He’s faced easier competition, having pitched nine games against teams in contention right now against Hernandez’s 14, and worked in front of a better defense, as New York leads Seattle in turning batted balls into outs. He may have pitched in worse weather. I don’t know that he has. If it he has it would be a point for him. A credible case for Sabathia will have to work, then, from one of two points. The first would be essentially aesthetic, grounded somehow in the experience of watching them. I’ve seen both Sabathia and Hernandez a lot this year, including in person. Sabathia is basically a man of pitcherly virtues; he moves the ball around a lot, hits the catcher’s glove just so, throws a lot of different pitches, throws each of them in different registers and maintains a certain rhythm, so that hitters stay slightly jumpy. His main strength is that he more or less never has a bad start. He’s Mark Buerhle with more gifts from God. Hernandez mauls people. He may as well be throwing marbles and bowling balls for all the chance anyone has to really crack him. Half the time he looks as if he’s one whispered suggestion away from ripping the batter’s arm out of the socket and using it to beat him to death. I don’t think the idea that he’s somehow less ace-like than Sabathia is supportable. 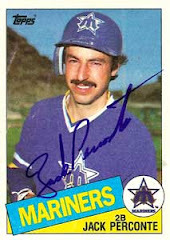 —1983 Seattle Mariners. Scored 3.44 runs per game in a league scoring 4.48. Their main leadoff hitter was Spike Owen, who hit .196/.257/.271; primary catcher Rick Sweet hit for the exact same OPS; nine players had OBAs worse than .260 in at least 50 ABs. —1999 Minnesota Twins. Scored 4.26 runs per game in a league scoring 5.18. This was the year when Doug Mientkiewicz hit .229/.324/.330 from first base in 118 games, while Cristian Guzman rocked an OPS+ of 38 in 131 games. Famously couldn’t find playing time for David Ortiz coming off a year when he hit .277/.371/.446 in 86 games at age 22. —2003 Detroit Tigers. Scored 3.65 runs per game in a league scoring 4.86. Of their many impressive accomplishments, I was always most taken by this: This team ran out Dean Palmer for 100 ABs where he posted an OPS+ of 12. Also of interest: Both Andres Torres and Omar Infante played for the aught-three Tigers, raising the question of whether this team was as great a source for 2010 what the hell performances as the 1992 Angels were for gritty Torre Yankees. I don’t know if Hernandez should win the Cy Young over Sabathia. Awards are what you make them and voting for someone because everything and everyone outside of New York is insignificant makes as much sense as anything else. I do know that if Hernandez doesn’t get the Cy he ought to get a medal and a parade. 11-10 on a team more impotent than the 1999 Twins? That’s ridiculous.﻿ Lefty Grove wouldn't have cracked .500 with these jokers.